Let us help make your wedding or commitment ceremony beautifully delicious. We’ll work with you to create favors, bridal shower treats and party trays everyone will adore. 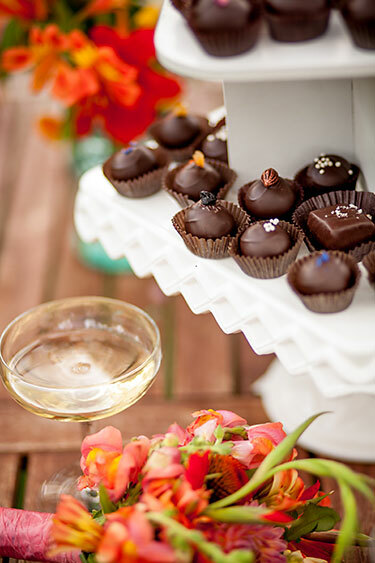 In fact, the readers of Wisconsin Bride magazine for four years running have named Gail’s chocolates as the Best Favors of 2009, 2010, 2011, and 2012. The two-piece box, starting at $4.25, is our most popular favor. Select the truffles you prefer or let Gail create an assortment. Choose our logo box or a custom, solid-color box in either the two- or four-piece size. Colors include aubergine, pistachio, mocha, black, silver metallic, frosted, dusty gold, robin’s egg blue, brown, cream, gold metallic, white, pumpkin, bright pink and red. We also offer a white one-piece box, starting at $2.25. We can decorate boxes with your custom labels and ribbons. Our Goodman Community Center Hearts are another favorite. These eight, gold-foil wrapped dark chocolate hearts come in a clear bag tied with ribbon for $3.50 each. All profits go to the Goodman Community Center. If you would like truffles for dessert, we can provide them in bulk, packed into cake boxes. Prices start at $1.95 per truffle. We also have available a white truffle tower (pictured) available for rent. The tower can be rented for $25, and can be used with all 5 tiers, or fewer, if desired. During the summer, we can also provide sorbet. In the winter, our Hot Chocolate mix is a popular favor. Please order at least two weeks in advance to ensure time for your packaging to arrive. Some seasonal flavors are only available during certain months. For one-piece boxes and special packaging, please order at least four weeks in advance. Volume discounts are available on most orders exceeding 50 pieces. Contact Katharine Hillman, who will help you find that perfect wedding accent and provide a customized quote, at katharine@gailambrosius.com.